The Blue Tigers are currently playing in the ongoing SAFF Championship 2018 and have reached a crucial juncture in the competition. Stephen Constantine's men get set to lock horns with Pakistan in the all-important semifinal. The Indian football team is the only unbeaten side in the competition thus far. The Blue Tigers were placed in Group B alongside Sri Lanka and Maldives while Group A consisted of Nepal, Pakistan, hosts Bangladesh, and Bhutan. Ashique and Lallianzuala Chhangte scored a goal-a-piece in India's 2-0 win over Sri Lanka. The scoreline could have been much more favourable for the Blue Tigers in this match but there were just too many chances that were squandered in the final third. 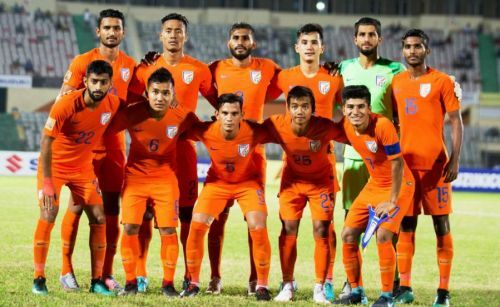 With big names like Sunil Chhetri, Jeje Lalpekhlua, Sandesh Jhingan, Gurpreet Singh Sandhu missing, the young squad – being led by Subhashish Bose – played well to ensure a 2-0 win over the Maldives in their next Group match. Nikhil Poojary and Manvir Singh were the goalscorers in this encounter to ensure India are safely through to the semifinals. Goalkeeper Vishal Kaith also pulled off a few crucial saves late in the 2nd half and Constantine will be hoping the custodian remains solid in the upcoming match as well. Constantine made 5 changes to the Indian squad for their match against Maldives. Davinder Singh, Jerry Lalrinzuala, Vinit Rai, Nikhil Poojary, Manvir Singh got starts. The Indian players worked hard but again missed a few sitters like they had in the match against Sri Lanka and finishing is one thing which needs to be addressed by the coach. The Englishman would now look to ensure that the perfect combination of 11 players is started against Pakistan in the semifinal after the takeaways from the initial few matches. Meanwhile, Pakistan began their campaign with a 2-1 win over Nepal in Group A. They lost their 2nd match with a slim 0-1 scoreline against the hosts Bangladesh before ultimately ending their group stage campaign with an emphatic 3-0 win over Bhutan. Nepal, Pakistan, and Bangladesh were all tied on 6 points in Group A but the former two teams progressed to the semifinal stage courtesy of a better goal difference. If we are to look at the head-to-head record between India and Pakistan, the former have the upper hand. Out of the 23 times the two sides have met, India have won 10, 10 games were drawn and 3 were won by Pakistan. The last time the two locked horns was 5 years back, in the 2013 SAFF Championship, and India emerged as the victors with the solitary goal in the match. However, this was a long time back and it will be hard to make any predictions for the upcoming match as it promises to be an evenly-contested match. You can also Catch ALL the LIVE updates of the match on Sportskeeda! Will India be able to secure a place in the final and have a shot at defending the SAFF Championship? Do share your opinions in the comments section below.